W. W. Norton & Company, 9780393010749, 352pp. Poems to Read is a welcoming avenue into poetry for readers new to poetry, including high school and college students. It is also meant to be a fresh, valuable collection for readers already devoted to the art. 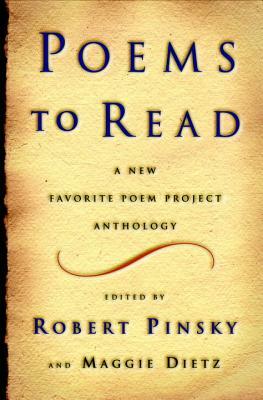 This anthology concentrates on the actual pleasures of reading poems: hearing the poem in your voice, bringing it to other people, musing about it, taking excitement or comfort from it, wandering with it or--as in the Keats letter quoted in the Introduction--having it as a starting post. Many of these 200 poems are accompanied by comments from readers of various ages, regions, and backgrounds who participated in the Favorite Poem Project. Included are poems by John Donne, Walt Whitman, William Butler Yeats, Langston Hughes, Elizabeth Bishop, Gwendolyn Brooks, Seamus Heaney, Allen Ginsberg, and Louise Gl ck, to name a few. The editors offer their own comments on some of the poems, which are arranged in thematic chapters.